In the work «Des Couleurs Symboliques dans l’Antiquité, le Moyen-Age et les Temps Modernes», the French baron Frédéric Portal (1804 -1876) attempts to both record and systematically portray the symbolism of colours according to their principles. First published in Paris in 1857, this revolutionary work was to reappear one hundred years later in an unaltered edition. Portal’s analysis draws upon the Egyptian religions; the old Iranian religion of the Mosaic tradition; Jewish tradition; and religions originating both in the Mediterranean region and the culture of the Middle Ages. His sources include various Eastern traditions — both Chinese and Indian. The author describes the symbolic value of colours and the rules governing their composition or opposition, while adapting a diagrammatic form based on three fundamental elements. 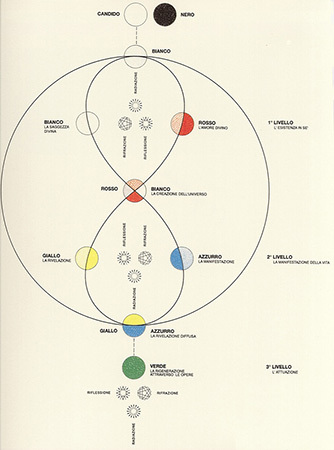 The basic diagram incorporates the divine language directed towards all of humanity and revealing divine existence; the holy language follows, which originated around cultic shrines and stipulates the symbolism not only of architecture, sculpture and painting, but also of religious ceremony and the paramenta of priests. The profane language — the material expression of the symbols, reverberating with the last echo of the eternal truth — is situated on the lowest level. In accordance with this language system, Portal compiled a diagram of the Language of the Symbolic Colours, placing great value on the knowledge of their grammatical rules — in other words, their style. In the beginning is the fundamental principle of light and darkness, represented by the two colours white and black. White is not in this case an actual pigment, but relates to the emanation or «outflow» of divine light which originates in the sun and is thus better described as radiant white. Black is seen as the negation of colours, and is the product of burning, linked to the spirit of darkness. This dual principle is an intrinsic part of the divine and is therefore located outside of the three actual colour planes: light exists (according to Portal) only through fire, which has red as its symbol. Red and white thus also occupy the first plane, the place of love, yearning and will — existence per se. White signifies divine wisdom, and red is the symbol of divine love. These two attributes of God are the source of creation of the universe, and thus also the second plane. Here, life itself is manifest, and reason reigns. Yellow and blue are the colours belonging to this second plane, symbolising intelligence and the word. Yellow is the revelation of love («la revélation d’amour») and the wisdom of God («la sagesse de Dieu»), while blue symbolises their manifestation in life («manifestée par la vie»). Green arises from the combination of yellow and blue, and belongs to the third plane of realisation and deeds. Green is the manifestation of love and truth as revealed in deeds and action. Green symbolises charity and the regeneration of the soul («la regéneration de l’âme») through action and influence. The circle is intended to show that, on all three planes which are transferred into temporal existence, the colours can in turn live in three different dimensions: in the divine world, the spiritual world and the natural world, according to the experience of the bodies to which they belong. The divine world is the realm of the radiating bodies (light emanates from within them), and the spiritual world is the world of the translucent bodies which diffract the light that penetrates them, re-transmitting or reflecting that light after it has fathomed their interiors. This is the world of the semi-precious stones and pearls, the shining objects which can share in the divine world — the world of volumes. The natural world is the world of mat, opaque bodies, to whose nature light does not belong, and which only reflect light, without the interior of the body being penetrated — the world of surfaces. Two rules are dominant in Portal’s system: the rule of composition and the rule of opposition. With the former, the mixed colours (pink, purple, hyacinth, violet and grey) are obtained from the five colours — white, red, yellow, blue and green. These colours acquire their special significance from the combination of the meanings of the colours from which they are composed. Here, the dominant colour provides the meaning, while the subordinate colour acts as a modifier. For example, red (love) and blue (truth) will form purple (the love of truth). If black is combined with other colours, the features will revert to their opposites: mixed with black, red, the divine love, when will become the symbol of a hellish love — egoism, or the «lower» passions. Contrary to expectations, the rule of opposition does not relate to the actual ratios of two colours, but describes the dual nature of one and the same colour. The rule of opposition bears a general relationship to the language of colours and to symbolism. Red signifies love and egoism in the same way as the snake in Genesis is not merely the embodiment of the Messiah and wisdom, but also the evil spirit; green can signify the Ascension into heaven or the slide into hell — either wisdom or madness. The large illustration shows the geometrical figure of a lemniscate — a curve of higher order from Cassini — within the circle which incorporates both the first planes. To an equal degree, this special curve both separates and joins the point at which it intersects itself. It is a double curve. The lemniscate joins the colours and at the same time emphasises the various planes on which they are located. Its special feature is that it joins sphere and cylinder — the union of divine fullness (expressed by the sphere, made sacred by its centre which, at the same time, it protects) and the tragedy of the cylinder (whose axial centre is geometrically infinite), condemned to eternal guidance while at the same time being transitory. On the symbolic and spiritual plane, the church corresponds to the cylinder as a pointer of the way, an organisation created by mankind in which the divine can indeed become manifest, but whose own destiny is both temporary and temporal. 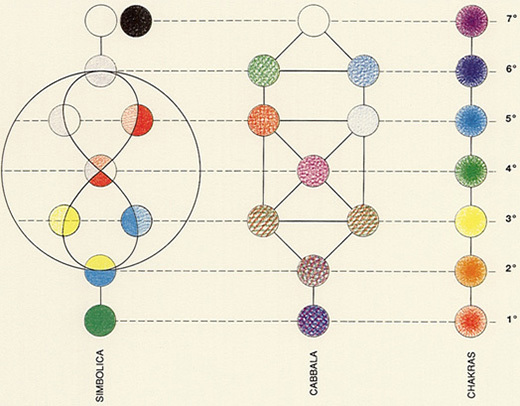 The smaller illustration explains the structural analogy of three different models — symbolism, the Hebrew cabbala and the Indian system of the chakras. The observer is encouraged to find corresponding features in each system, and thus to bestow upon it the analogy of form and, if applicable, analogies of meaning. This combination of the three systems is indeed historically verifiable, but nevertheless questionable, since Portal’s metaphysical system stems from the same cultural tradition as its two partners. All the same, we can still speak of analogies between three spiritual systems. With metasystems, the form will always contain valuable pointers to the meanings they convey, which is a revelation in itself. Bibliography: F. Portal, «Des Couleurs Symboliques dans l’Antique, le Moyen-Age et les Temps Modernes», Paris 1957; R. Gross, «Warum die Liebe rot ist», Düsseldorf 1981.